It’s quite likely that you have never read a book look We Are All Completely Beside Ourselves. It is the story of a two sisters — and a family — seemingly like many others and yet unlike any other. The story is narrated by Rosemary Cooke, who is both a charming and eccentric storyteller and an unreliable narrator. Fowler’s achievement in crafting Rosemary’s persona and narrative voice is impressive. She is smart, self-effacing, witty, sardonic — and heartbroken. More importantly, her tale, and her way of telling it, is spellbinding. The narrative moves back and forth between Rosemary’s childhood and her college and adult years, as she recalls the brief years of innocent childhood before tragedy struck the Cookes. For the first 75 pages, we are introduced to the lives of, and relationships between, the various family members: Rosemary’s research scientist parents (her father is a professor at Indiana University), aloof older brother Lowell, and fun-loving sister Fern. There is a strong sense of foreboding in the first part of the book, a black cloud looming over Rosemary and the Cooke family, but it is mentioned only in vague terms. Something happened to Fern; she “disappeared” from their lives and no one has ever been the same. We Are All Completely Beside Ourselves describes the effects of Fern’s disappearance on the family, each of whom copes with the loss in a unique way, one that confounds the other family members. The events in this novel might seem far-fetched were it not for the fact that they are based on actual events. Fowler’s story reminds us that humans are capable of both amazing and shameful things, and that our hubris often leads us into uncharted and dangerous territory. Even when we do our best with what we know, and with good intentions, it is often not good enough; the damage is done. We Are All Completely Beside Ourselves is an example of a novel that is both critically acclaimed and embraced by readers. It was a bestseller when published in May 2013 and was issued in paperback in late February. 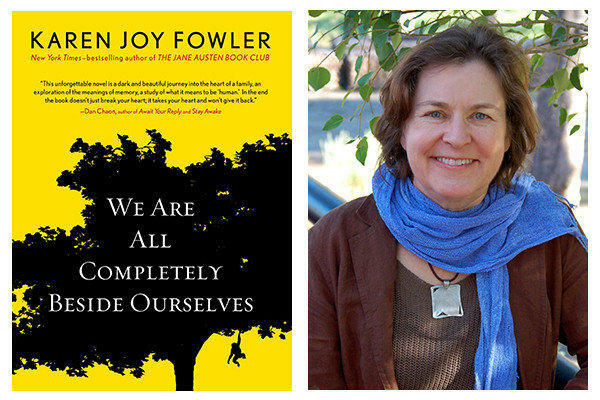 Fowler is best known as the author of The Jane Austen Book Club, her most accessible work, which was a huge hit in 2004. Thanks Anna. I thought I’d try a “Sunday Short” for something different. My reviews have gotten too long and are probably revealing too much of the plot (although I think I’ve avoided spoilers). I’m going to try to keep them in the 500-750 word range, so that they can be read in 5 minutes max. I’ve seen this book reviewed on a few blogs, but your’s is more in depth and grabbed my attention. It sounds like a must read!